When individuals and communities are able to realize their rights — to education, social security, information and, most importantly, non-discrimination — the personal and societal impacts of HIV and AIDS and other chronic illnesses are reduced. Often persons living with HIV/AIDS and other chronic illnesses often face difficulties in accessing social protection benefits including access to health care. However, individuals are more likely to seek testing in situations where an open and supportive environment exists — one in which where they are protected from discrimination; treated with dignity; have access to treatment, care and support; and where HIV/AIDS is destigmatized. In supportive environments, people who are HIV-positive may also deal with their status more effectively by seeking and receiving treatment and psychosocial support, and by taking measures to prevent transmission to others, thus reducing the impact of HIV on themselves and on others in society. According to the ILO HIV and AIDS Recommendation (2010), workers living with HIV (and their dependents) should have full health care access, whether this is provided under public health, social security systems or private insurance schemes (para 18). Health care should include free or affordable voluntary counseling and testing, antiretroviral therapy and adherence education, information and support, proper nutrition consistent with treatment, and treatment for opportunistic infections and sexually transmitted infections (as well as other HIV-related illnesses). In addition, support and prevention programmes for people living with HIV, including psychosocial support should be provided (para 19). There should be no discrimination against workers or their dependents based on real or perceived HIV status in access to social security systems and occupational insurance schemes, or in relation to benefits under such schemes, including for health care and disability, and death and survivors’ benefits (para 20). Access to social security systems and occupational insurance schemes, and the associated benefits (such as survivors’ benefits), should not be impeded by discrimination based on real or perceived HIV status (para 20). The ILO code of practice on HIV/AIDS and the world of work recommends that governments ensure that benefits under national laws and regulations apply to workers with HIV/AIDS no less favourably than to workers with other serious illnesses. Policy makers should take into account the progressive and intermittent nature of the disease and tailor schemes accordingly in their design and implementation. For example, benefits should be made available as and when needed, and claims should be treated expeditiously (para 5.1). All workers, including workers with HIV, are entitled to affordable health services (para 4.10). 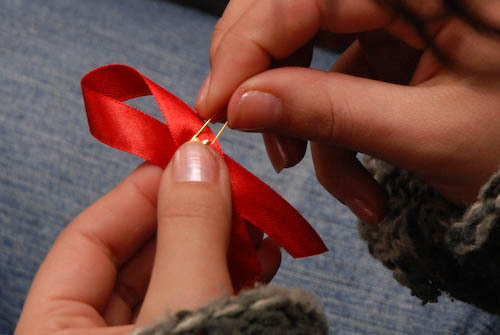 Photo credit: “HIV Ribbon” by Trygve Utstumo (CCBY 2.0 via Flickr). This paper exams why social protection is needed for persons living with HIV; goals, actions and results for HIV-sensitive social protection; global priorities in HIV-sensitive social protection and the role of UNAIDS in meeting this goals. HIV-Sensitive Social Protection: What does the evidence say?